Best Baby Organics is a website/shop/blog that I kind of stalk. It’s beautiful and I love their selection of products, plus they’re cool people and working to make the world a better place for parents and babies. I’m working with them to bring a review to you at some point in the future, but until then I wanted to let you know about this awesome contest they have going on–you’ll have to enter very, very soon, though…it ends on May 31st! I’m bummed that I didn’t know about it before, but I guess that’s going to happen now that I’m Internet-less. Boo. 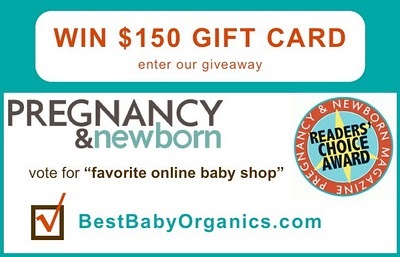 You can win a $150 gift certificate to http://www.bestbabyorganics.com/ and just for entering, you’ll receive a 10% discount code for their store. PLUS, when you vote for them (that’s how you enter the contest), you’re eligible to win a whole slew of other prizes from Pregnancy & Newborn. Who can beat that? To nominate and vote for us as “favorite online baby shop” and “favorite online maternity shop” enter BestBabyOrganics.com as an “other” option in these categories. The whole thing takes about 1 minute to complete.